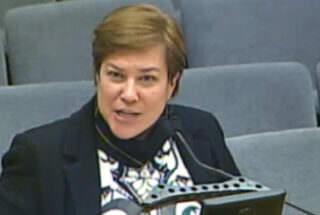 LA Unified Chief Financial Officer Megan Reilly, who is widely credited with steering the district through the Great Recession but has repeatedly warned of coming deficits, has resigned to take a similar position at the Santa Clara County Office of Education. Reilly was hired by LA Unified in 2007. On Monday, Superintendent Michelle King thanked Reilly for her years of service. Reilly was previously the executive director of the Naval Postgraduate School in Monterey, Calif.
Reilly, who earned $280,405 in salary and benefits in 2015, leaves the district just before King is expected to outline in February her plans for dealing with next year’s deficit, which Reilly first reported last month. In December, Reilly warned there will be reductions when she reported to the board that the district notified the county and the state that it may not be able to meet its financial obligations in subsequent years because it faces a cumulative deficit of $1.46 billion through the 2018-19 school year. She had also previously said that increasing student enrollment alone would not solve the district’s deficit projections. In March she had told the board, “This is the healthiest year in the past decade. For the first time since 2008, this is the first budget without a need for a fiscal plan.” But she also urged immediate action for the coming years and warned that the one-time payout from the state that had shored up that budget year could not be counted on in the future. Her new position is chief business officer of the Santa Clara County Office of Education. That office is led by Superintendent Jon R. Gundry, who was hired in 2014. Gundry was previously superintendent of the Pasadena Unified School District. She will begin her new position on April 17. Reilly, who graduated from an all-girls’ high school in Baltimore, earned a bachelor’s degree in history from Loyola University, a master’s degree of science in management from Naval Postgraduate School and a law degree from Monterey College of Law.